IPEP member Ross Roberts is co-presenting a BASES workshop on Nov 4th at Chester University entitled "Welcome to the Jungle: Getting started in Sport and Exercise Psychology" which is aimed at people starting out on the road to becoming accredited practitioners. The workshop was popular and well received the first time it was run. David Brailsford CBE to lecture on Elite Performance at the Institute. 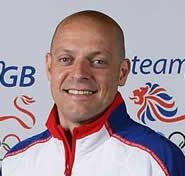 David Brailsford, CBE, was Performance Director of British Cycling during both the Athens and Beijing Olympic games. He is credited with being the mastermind behind Great Britain’s most successful Olympic team. He was subsequently voted ‘Coach of the Year’ in the BBC Sports Personality of the Year Awards in 2008, where his team was also named team of the year. David was appointed CBE in the New Year’s Honors List 2009. David holds a degree in Sports Science and Psychology and obtained an MBA from the Sheffield Business School. Earlier this year he was awarded an honorary doctorate at Bangor University. Considering all of his achievements, his lecture at Bangor University in November titled ‘Elite Performance’ promises to be un-missable. For more information see our events page. The GB telemark ski team are visiting the Institute for the Psychology of Elite Performance (IPEP), this weekend 16/09/2009. The team have been working with IPEP members in preparation for their upcoming competitive season. This is the second consecetive year that the GB team have come to the institute for pre-season preparation. IPEP members Lauren Mawn and Stephanie Connell have provided the team with numerous workshops including the development of a performance profile, goal setting, imagery, and season specific team building. Mike Khan delivers workshop on coaching for Sports Council for Wales. Sports Council for Wales and IPEP member Mike Khan recently teamed up to provide the a coaches workshop for the North Wales institute of sport. During the workshop, titled ‘Making time work for you – Reaction time principles and sport’, professor Khan shared his insights from over 20 years of experience of coaching and theoretical expertise. The interactive session challenged “coaches thinking” and looked at the importance of reaction time principles in sport. The session also discussed the various factors that influence reaction time in sport such as: the alternatives in attacking and defending situations, cue utilization and prediction, use of deception and dual tasking. 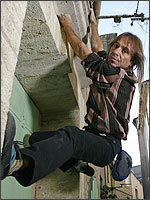 This heart-stopping Cutting Edge documentary follows Alain Robert, dubbed 'The Human Spider', on his quest to 'free climb' some of the world's tallest buildings using just his bare hands, with no ropes or any safety equipment. The programme includes an interview with IPEP co-director, Tim Woodman. Shown on Channel 4 on Monday, 12 October 2009. It is currently available to watch on Channel 4 on demand (click here for link). Bangor University's Institute for Psychology of Elite Performance will be partnering with Sport Council for Wales investigating coaching behaviours in relation to psychological skills and training. Rosie Poynor as the selected PhD student, is due to commence the four year research project in November 2009. The emphasis will be upon designing sport psychology programmes which are tailored to coaches' needs regarding the application of sport psychology with their athletes. Rosie will also be working with Elite Welsh athletes on an applied basis during the next four years.